Director Deniz Gamze Erguven’s sets Mustang — a tale of female rebellion against a society steeped in patriarchal tradition — in a village far from sophisticated Istanbul. Hold your assumptions, though: Mustang is more than a scream against obvious inequality. Erguven’s movie also qualifies as a celebration of five young women who light up the screen in ways that keep them from becoming pawns in a political statement. The movie makes its point, but never loses sight of the individual spirits that animate these women. 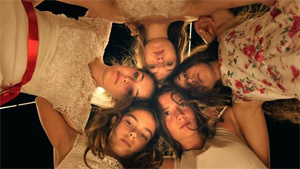 Mustang looks at five young sisters in a small Turkish town. Mustang opens with a scene in which the girls are playing with local boys at a beach. They seem carefree and unselfconscious about their bodies. Their freedom won’t last. Because their parents are deceased, the girls have been raised by their grandmother and a tradition-bound uncle who’s only interested in what he regards as propriety. Uncle Erol (Ayberk Pecan) thinks the girls have disgraced themselves by cavorting in the water with boys — even though they’ve only been involved in innocent play and perhaps a bit of flirting. Unswayed by reason, Uncle Erol decides that the girls must be locked in the house lest they further shame the family. He adds bars to the windows and disconnects all the phones. He makes the girls wear drab clothing, even though they’ve been denied contact with the outside world. What begins as a lark of a movie becomes a story about house arrest as the sisters are deprived of just about everything that might nourish their souls. Uncle Erol eventually decides that the best way to deal with his spirited nieces is to marry them off as quickly as possible. More indignities follow, including checks on the girls’ virginity. Grandma (Nihau Kolas) seems sympathetic to her granddaughters, but she’s powerless to resist tyrannical Uncle Erol. Erguven provides enough balance to keep the movie from becoming a screed, and Mustang ultimately focuses on what two of the unmarried sisters are willing to do to keep their spirits from being broken. An appealing young cast gives the movie a sense of sustained and authentic life, even as Erguven — born in Ankara and raised in France — explores the necessary defiance of young women who refuse to be shackled by the rules of a culture that demands submission. Mustang, a French entry, is one of five films nominated for a best foreign-language film Oscar.